Anne-Marie Bouchard, experimental videographer, worked with dancer Melanie Therrien and saxophonist Lyne Goulet. They created an interactive space in a fantasy world, integrating the viewer in the fairies’ dances. The viewer is placed in the hero’s position: first, standing in front of the “natural” world, the hero must decide to take on the journey. The hero is confronted then with unexplained forces of nature. Demons, ghosts and witches appear through video manipulation. A little further on the path, a fairy dances, calling the viewer forward. The longer the viewer moves near the fairy, the more the viewer gets caught up in her dance. 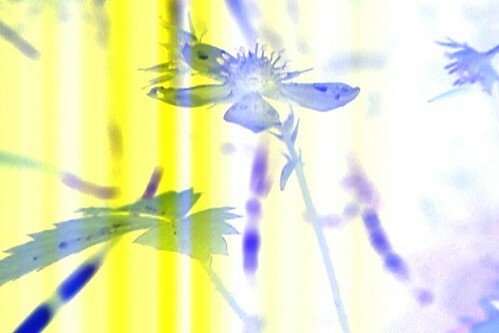 Anne-Marie Bouchard: Experimental videoartist, she works video as visual matter rather than objective witness. Her video work is inspired by intimate memories, ephemeral instants, like poetic bubbles in a fraction of time. Her camera work always suggest the presence of the person behind it, and the viewer is invited to look through her eyes, through her imagery. Her work is constructed in a poetic structure, where detail magnification, vivid colors, extreme slow motion and grain both create a highly individual signature. 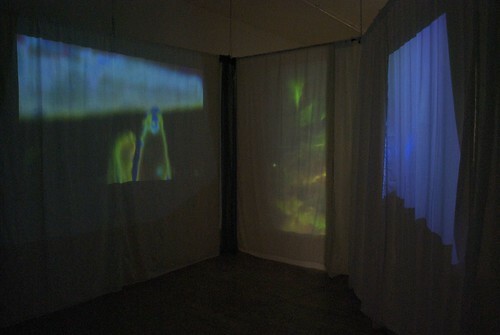 Her video installations immerse the viewer into her poetic imagery. Anne-Marie Bouchard graduated in Film Production from Concordia University, Montréal in 1995 and earned an M.A. in Arts Visuels degree from Université Laval, Québec in 1999. Mélanie Therrien : Professionnal dancer Mélanie Therrien works with talented choreographers Harold Rhéaume, Lydia Wagerer, Karine Ledoyen, Daniel Bélanger and Emmanuel Jouthe. She danced in professionnal events as stimulating as Dusk Dances, Osez !, Le fil de l’hisoire, Le Chemin qui marche, Tableau d’une exécution au Trident et Ma sœur Alice. Mélanie is a Expression-création teacher at l’École de Danse de Québec’s Danse-Études program. Lyne Goulet: Saxophonist and singer, Lyne Goulet evolves fluently in different musical styles : jazz, contemporary music, lounge, blues, world… She has performed in various music festivals and has recorded albums with Interférence Sardines, Marie H. Blay and a few others. She is involved in the Ligue d’improvisation musicale de Québec with her accomplice Fred Lebrasseur, and teaches music to children at l’Accroche-note music school. Included Material: 1 computer, 3 speakers, 9 various sizes copper pipes, screens, curtains, surround decoder, 2 video HI8 cameras, 7 infrared spots, 2 Pinnacle instant dvd recorder, tripod. Space two: 10 five minutes abstract segments, playing randomly in the presence of a spectator, dimming when no one is in a specific viewing space. 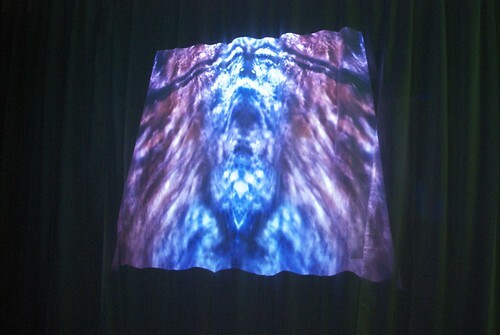 Images and sound bring on illusions of fantastic creatures by video & sound manipulation and transformation. Sequences controlled by computer. I like to magnify the tiny detail, to focus where no one would. To me, video isn’t an objective witness but a tool to fragment our world’s conception, a filter through which intimate memory, partial and ephemeral events can be recorded. I make sense out of linear narrative construction, I rather choose an impressionist way to sculpt in time and compose visual poetry. I distort the video image towards non-figurative representation by the use of multiple filters, superimpositions and extreme magnification. I compose my soundtracks using sound the same way, by the combination of slow motion and subsequent transformations. 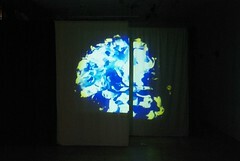 Installations allow me to involve the viewer directly into my dreamlike world. I give access to my abstract imagery through playfulness and interactivity. I connect with the other by allowing the viewer’s physical presence to have an impact on my images.